The majority of us continue to tee up on each par three with a little subconscious hope: Maybe THIS will be my hole in one! Is it going to happen now? But my best friends aren’t here! I can’t stay and celebrate today! Or worse: I’m alone!!! And, once again, it’s a little left, a little right, a little short. Lori Boettler, of Moraga Country Club, has the best story around, quite possibly anywhere: She has achieved her hole-in-one goal…or should I say goals: Right-handed AND left-handed. Lori is the first verified woman golfer who has accomplished this feat! On May 28, 2003, she aced her first hole in one playing right-handed at her home club using a Callaway Divine Nine and a Pro V1 Ball, hitting a straight shot that bounced twice and disappeared into the hole. Because she had also golfed left-handed, she wondered if she could accomplish the same feat switching to left-handed clubs. She spent several years honing her skills from this angle. By September 2018, she was ready to quit this quest and return to her right-sided game. Left-handed clubs were hard to find for women, her score was not improving, and it was time to make a switch. But causal conversation and words can become a renewed goal. A friend encouraged her to keep at it. 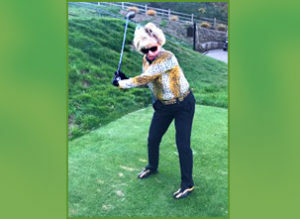 On September 7, during a Michigan trip with her husband to visit friends, she hit her tee shot straight on Hole No.2 2 at Treetops Golf Course using her Callaway 6 Iron XR. As she and her husband searched for the ball, she did what many others have done when a ball goes missing: Hopefully looked in the cup. Her Pro V1 ball marked with her signature “L” was indeed tucked into the hole. Her feat had been witnessed by several golfers waiting at the next tee box.